Hu Jintao (born 21 December 1942) is a Chinese politician who was the paramount leader of China from 2002 to 2012. Hu Jintao served as President of the People's Republic of China from 2003 to 2013. And served as the General Secretary of the Communist Party of China from 2002 to 2012 and Chairman of the Central Military Commission from 2004 to 2012. Hu was born in Taizhou, Jiangsu. Hu left office on 14 March 2013 and the office was taken by Xi Jinping. Hu Jintao was educated as a hydraulic engineer from Tsinghua University in 1965. According to official biographies, he has a photographic memory. Politically, he is moderate and careful. He spent most of his previous career in Tibet and the poorer provinces, and was therefore unknown to Western analysts until he unexpectedly became president. Even as a president, he was quite private - and so has never given an interview. 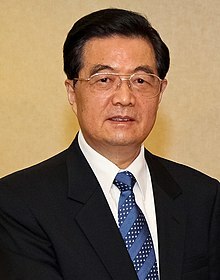 ↑ "Profile: Hu Jintao". 2004-09-16. Retrieved 2018-01-21. This page was last changed on 24 April 2018, at 00:43.